VICS（Vehicle Information and Communication System）delivers vehicle information to car navigation systems, overlapping it onto the digital map or representing it in characters and graphics. 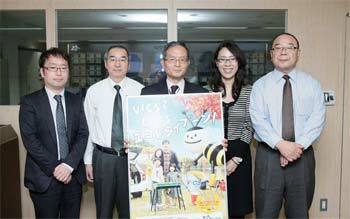 It dates back to 1996 when service of VICS started in Japan ahead of the world. For these past several years, the number of units of VICS receiver shipped by year is about 3 million, exceeding 30 million units in accumulating total in March, 2011. This indicates the present situation that many drivers come to use the service matter-of-factly. This issue picks up Vehicle Information and Communication System Center. 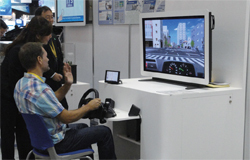 Toward the spread of VICS, the Center build "VICS drive simulator" (VICS-DS) from early on, aiming to have as many people as possible to experience and understand its structure and service contents. The Center has been repeating renewal in order to have it understood more effectively. In developing its latest version, "UC-win/Road Drive Simulator" based on 3D real-time VR software "UC-win/Road" of FORUM8 (UC-win/Road-DS) was adopted. The result was exhibited to the public for the first time in ITS (intelligent transport systems) World Congress Orlando 2011 (from 16 to 20 in October in Florida, U.S.A.). After some adjustment, VICS center exhibited six VICS-DS units at the Tokyo Motor Show 2011 held in Tokyo Big Sight from December 2 through 11. Although it was on a weekday that the interview was made, visitors formed a long queue waiting for their turns. It was impressive to see many visitors operate DS seriously as if they are actually driving a real car. 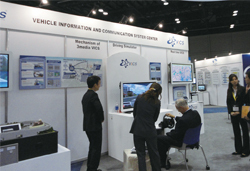 Following a joint study on Road Automobile Communication System by the nation and private companies, in 1990, 3 ministries of the National Police Agency, Post Office Department (currently Ministry of Public Management, Home Affairs, Posts and Telecommunications), and the Ministry of Construction (currently Ministry of Land, Infrastructure and Transport) established "VICS Liaison Council". After that, they advanced various actions for putting VICS to practical use, and the VICS center was established in 1995. The center has enlarged its service areas in turn starting with a service to offer information in Tokyo and Osaka areas in 1996. It completed national expansion in 2003. Reflecting this, the accumulated number of onboard VICS equipments shipped exceeded 10 million in 2004, 20 million in 2007, and 30 million in 2011. The VICS center consists of 29 directors including Chairman of board of trustees (Mr. Katsuaki Watanabe, Senior Adviser of Toyota Motor Corporation) and 41 councilors. It constitutes Executive Office consisting of General Affairs Div., Planning Div., Communication and Broadcasting Div., Development and Engineering Div., Service Enhancement Div, and Next Generation VICS Project Team. It has Information Strategy Team in Emergency, and 71 supporting member corporations participate in the Center (as of November 2011 for both). VICS displays vehicle information such as congestion, the time required, traffic obstruction, traffic restrictions, and parking lots on the car navigation system. Such functions support drivers' choice of route avoiding congestion, reduction of the time required, and psychologically comfortable driving. It is also expected to lead to social effects such as facilitation of transportation, improvement in safety, environmental preservation, and improvement in economy. Moreover, license fee for watching and hearing (315 yen including consumption tax) is included in the purchase rate of the receiver that supports VICS such as a car navigation system, and additional charges are unnecessary. According to Ms. Natsuko Miyamoto in Service Enhancement Div., stationary types of recent car navigation systems support FM-VICS by 100%, and portable types by 30%. She says that environment is so set that more and more drivers use it without being aware. The process of using VICS information can be divided into four steps: collection, process / editing, provision, and utilization. Traffic information collected by highway administrators and metropolis and districts polices in line with each aim is gathered at VICS Center via Japan Road Traffic Information Center (JARTIC). The center processes and edits these pieces of information so that they can be transmitted in real time through three kinds of media and represented in three types of methods. Later, these pieces of information are delivered to 53 broadcasting stations that dispatch FM multiplex broadcasts covering the nation over (one for each of the metropolis and districts except Hokkaido, where there are 7 stations), national road traffic control centers in all of the nation, or towards private enterprises under the trust from JARTIC. The media that VICS information is offered to for car navigation systems are the radio wave beacon, the light beacon and the FM multiplex broadcast. Among them, the radio wave beacon is mainly installed on express highways (including some of general highways) by road administrators. When passing the reception area right under the radio wave beacon (2.4GHz zone), a vehicle equipped with a beacon receiver is able to receive information within about 200km ahead in the direction of travel. Light beacons are installed by the metropolis and districts police on main general highways. When passing the reception area, the vehicle mounted with a beacon receiver is able to receive information within 30km ahead in the direction of travel and 1km in the rear direction. In contrast, the FM multiplex broadcasts use facilities of NHK and FM broadcasting stations at each place. Overlapped with NHK sound broad casting, information being received about the metropolis and districts including the vicinity of the prefectural border with the adjacent prefecture is offered and renewed every five minutes. The VICS information received is represented on the display of the car navigation system as a map, a simplified graphic, and characters. The map representation is displayed automatically if it conforms to 3 media. Regarding a simplified graphic representation and the character representation, they pop up as soon as they are received with a beacon (a radio wave and light), while they must be selected manually with the FM multiplex broadcast. In addition, the since FM multiplex broadcast provides a wide range of information within the reach of the radio wave, graphics are always displayed with their tops to the north. With beacons, on the other hand, graphics are displayed in line with the location of the vehicle or the direction of travel. In 2011, two VICS-related services were newly started. ITS Spot is one of them. Using the same communication technology as ETC, this realizes road-vehicle communication of high-speed and high capacity between the ITS spots installed mainly on the expressways nationwide and the vehicles mounted with compatible car navigation systems. In addition to the function as ETC, it enables diverse services including: dynamic root guidance for selecting the optimum route covering widespread information as much as within approximately 1,000km, and the safe driving support function more advanced than the conventional radio wave beacon. Another one is DSSS (Driving Safety Support Systems) that aims to prevent traffic accidents caused by delay in the recognition or judgment of a driver. This communicates the risk factors in the vicinity to the vehicle mounted with a car navigation system compatible with DSSS by way of cooperation of infrastructure and the vehicle through the light beacon. Its operation started in the areas of Tokyo and Kanagawa last July. Furthermore, a study is being made towards digitization of the media. Attention is paid to new possibility with increase in the amount of information brought about by this. As mentioned at the opening, VICS center started development and operation of VICS-DS from early on. The functions as DS have been advanced as it was updated from the first generation (2003 to 2004), the second generation (2005 to 2006), to the third generation (2007 to 2010). 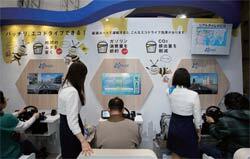 Through practical use in various exhibits, a certain effect of pulling in customers and advertising was recognized. On the contrary, needs for coping with new challenges emerged, such as increase in reality, enhancement of contents, and improvement in operability. In other words, it was required to change into the DS capable of being experienced positively in more real environment from the conventional passive experience with scenario and route set beforehand using the map of a car navigation system. In fact, as such a solution, Mr. Makoto Hozaki, Deputy General Manager of General Affairs Div. and Mr. Akihiro Kokatsu, Superintendent of Development and Marketing Dept., Pioneer Corporation, who have been working on development of VICS-DS all the way in cooperation has paid their attention to UC-win/Road since starting development of the third generation. They wanted to introduce VR because there was a constraint in meeting the advancing needs for DS with the conventional approach. In general, however, VR tended to be expensive, so they did not come to shift at a stretch partly because of a problem of cost-effectiveness. However, in the autumn of 2010 when they were studying the concept of VICS-DS of the next generation, they decided to innovate the approach as they thought the conventional approach would not be able to solve the new challenges mentioned above. At that time when Mr. Makoto Hozaki participated in ITS World Congress Pusan 2010 held in Korea in the end of October, he experienced UC-win/Road-DS in the FORUM8 booth in the exhibition of the Congress. After returning home, he received presentation from our staff. From the beginning of 2011, these two people with Mr. Takemi Fukumitsu, Project General Manager of General Affairs Div., and staff of Planning Div., and Service Enhancement Div. organized a regular meeting to study development of VICS-DS of the next generation. In the meeting, they discussed how to improve the functions built up for the third generation and what the fourth generation would be like. After they decided to adopt UC-win/Road-DS by the end of January, they further studied the specific contents based on the DS for Tokyo Motor Show to be held in December. At that time, Ministry of Land, Infrastructure and Transport (MLIT) asked them if they could advertise ITS Spot planned to start operation in March, using the third generation, in ITS World Congress in Orlando 2011 to be held in October before Tokyo Motor Show. While it was difficult to add such a function to the third generation, it was expected that the fourth generation would allow it; therefore, they shifted to new studies of DS in consideration of uses for both events. It was May that they started specific actions towards building up a system of the fourth generation. Its target was set to families. In parallel with FORUM8 that took charge of a simulator part, they commissioned video contents to other video company. They kept on trial and error in investigating what could do by combining them. In September, though its degree of perfection was about 90%, they developed an operational version for ITS World Congress in Orlando 2011, capable of simulating ITS Spot service with commentary in English. After its first public exhibition in the Congress in October, they completed a new VICS-DS for Tokyo Motor Show consisting of three kinds of programs each of which takes three minutes and half, allowing experiences of the basic system of VICS, ITS Spot service, and DSSS service. 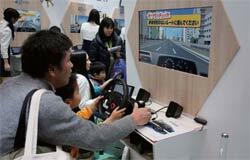 It was led to the operation in Tokyo Motor Show. Through this experience, Mr. Akihiro Kokatsu paid attention to the synergistic effect of flexibility and rendering of UC-win/Road-DS. At the same time, while he confesses that he was more or less worried if the basis of UC-win/Road-DS would allow representation as they conceived, he also recalls that as a result, they could realize DS with high degree of perfection, with our flexible support for detailed needs. In addition, Mr. Takemi Fukumitsu highly evaluates that it gives realistic representation of the link of DS and the display of the car navigation system. Representing the view on the user side, Mr. Toru Kawaguchi, Deputy General Manager of Service Enhancement Div. and Chief of Service Support Center, expects further improvement by rendering effects including hardware such as a steering wheel. Furthermore, Mr. Makoto Hozaki mentioned the requests such as its differentiation as DS and addition of a blinker function. Towards ITS World Congress in Vienna 2012, and the following ITS World Congress in Tokyo 2013 and Tokyo Motor Show 2013, he draws a plan of developing VICS-DS of the next generation in consideration of those elements. the basic system of VICS and services of ITS spot and DSSS had an excellent turnout all day long.